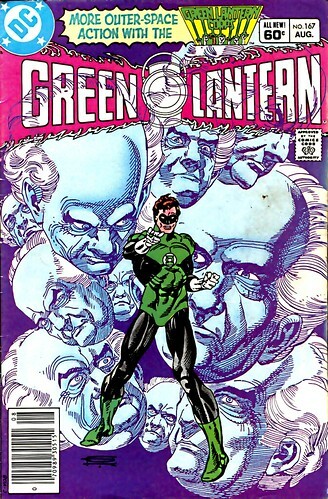 Green Lantern Volume Two--the one starring Hal Jordan--had a terrific run during the 1980s. Len Wein, Dave Gibbons, and Steve Englehart worked on the series during this period. John Stewart even became the lead character for a period of time. But it started winding down and losing sales despite the array of talent. Green Lantern #167 has Jordan with his finger raised as he stands among the Guardians of the Universe. This cover epitomizes the greatest thing about Jordan's character. He's a Galactic cop reporting to the ultimate authority, but Jordan's always been rebellious, never afraid to the Guardians when they've made a bonehead decision. In this run of stories, the writers had discovered the mythology surrounding the GL Corps was a goldmine of material. The series changed its title to "The Green Lantern Corps" with issue 201 in an effort to boost sales. The GL Corps only lasted 24 issues. 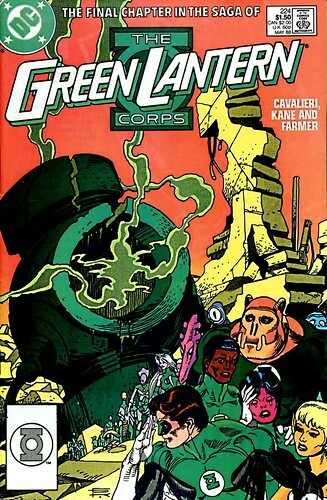 It was fitting that Gil Kane, the man who worked on the first issue back in the 1960s, drew the final cover to GL Corps #224. After an epic battle with Sinestro, the great power battery of the Corps was left "diminished but not extinguished" in the words of the lone surviving Guardian. There was enough power left to equip Jordan with a ring. The rest of the Corps were powerless and dispersed to live normal lives. This cover is a fitting tribute to the end of the series, with Jordan saluting the battery and his friends in a state of shock. Nuff said.